Eine Übersetzung auf Deutsch folgt so bald wie möglich. For at least 60 years, members of the Josef and Hulda Kahn family were an integral part of both the Jewish and Christian communities of Themar. The marriage of Josef and Hulda linked the Kahn and Walther families, both key families in the establishment and growth of Themar’s Jewish community in the mid 1860s. Marriages of their children and grandchildren forged links with the Christian community. The loss of the Kahn family and its deep roots in the Themar community was — and still is — significant. The eight Kahn children, 5 sons and 3 daughters, were all born in Themar and grew up there. 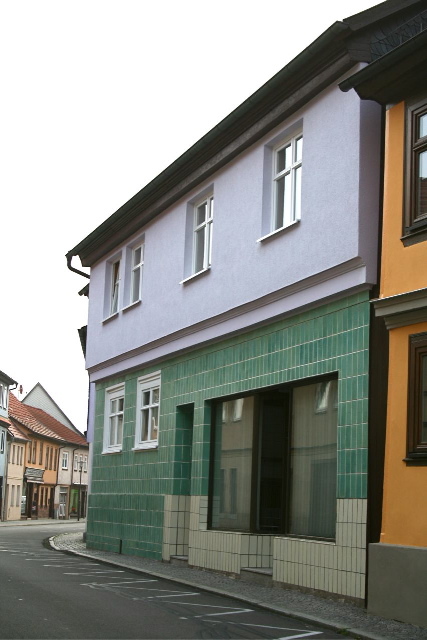 Josef was a master butcher and owned two kosher butcher shops in Themar, one in the Market Square just at the entrance to Bahnhofstrasse (site #37 on Manfred Rosengarten’s map), the other at the corner of Georgstrasse and Schulstrasse (site #33 on the Rosengarten map). The Kahns experienced both tragedy and joy in the early years of the 20th century: in 1909, their eldest son, Albert, died, apparently in an event related to military service. A year later, their eldest daughter, Else, married Markus Rosenberg and the couple continued to live in Themar; by 1913, Josef and Hulda had three young grandchildren. In 1914, three Kahn sons — Leonhard, Fritz and Adolf — and one son-in-law, Markus Rosenberg, the husband of Else, went to war for their country, and two Kahns — Leonhard and Friedrich Daniel — gave their lives. After close to 40 years of marriage, Josef and Hulda Kahn died: Josef in 1923, Hulda in 1929. They were both buried in the Marisfeld cemetery. At some time before 1928, two children, Paula and Julius, left Themar to live in other cities, Paula in Erfurt and Julius in Nürnberg. The two youngest children, Erna and Adolf, remained in Themar: Erna, the youngest daughter, married Wilhelm Haaß, a Themar Christian, and they had twins just before Hulda’s death. Adolf Kahn, the youngest of the eight children, continued to live in Themar, taking over the butcher business from his father. He fathered a child with a non-Jewish woman but remained unmarried. The 1930s were years of increasing crisis for the family: in 1932, one daughter, Paula, took her own life; in August 1933, in what would earlier have been an occasion of great joy, Julius Rosenberg married non-Jewish Elsa Pabst, and they had a daughter, Lotte, in 1934. In November 1938, the three men who were in Themar — Adolf Kahn, Markus Rosenberg and his son, Julius Rosenberg — were rounded up and hauled off to Buchenwald in the ‘Reichspogromnacht’ known as ‘Kristallnacht.’ (We do not know about Julius Kahn who was living in Nürnberg in 1938.) In December 1938, Wilhelm Haaß died, and Erna faced the “Aryanization” process of the Haaß machine shop business alone. In October 1939, less than a year after Wilhelm’s death, Erna died, leaving the twins orphaned and potentially vulnerable, like Lotte Rosenberg and Adolf’s child, to the Nazi persecution of “Mischling” children. Before WWII started, Julius Kahn made it to England, as did his niece, Irma Rosenberg; Elly Rosenberg also left Germany in 1939, heading for the United States. As World War II started, Else, Markus, and Julius Rosenberg, and Adolf Kahn were still in Themar; they were all murdered in the Holocaust. Elsa Rosenberg (née Pabst) and her daughter Lotte, the Haaß twins, and Adolf Kahn’s child survived. Presently, as you see in the Nachkommenliste/Descendants List below, we can link at least 26 people directly to the Kahn family. However the scope of their connection is much larger than that. Links to other families in Themar, both Jewish, such as the Walther families, and Christian, such as the Haaß, and links to Jewish families elsewhere in Germany such as the Rosenberg family of Lichenroth and the Hutzler family of Forth immediately expand the connections of the Kahn family. The present count of people with strong links to the Josef & Hulda Kahn family before WWII is at least 115, and this is probably an underestimate. 1. Albert KAHN, geb. 22 Aug 1887 Themar, gest. 25 Dez 1909 Meiningen.